The 35th Infantry Regiment Association salutes our fallen brother, PFC Joseph E. Cybulski, RA15434975, who died in the service of his country on September 9th, 1951 in North Korea. The cause of death was listed as KIA. At the time of his death Joseph was 18 years of age. He was from Cleveland, Ohio. Joseph's Military Occupation Specialty was 4745-Light Weapons Infantryman. The decorations earned by PFC Joseph E. Cybulski include: the Combat Infantryman Badge, the Purple Heart, the National Defense Service Medal, the Korean Service Medal, the United Nations Korea Service Medal, and the Republic of Korea War Service Medal. 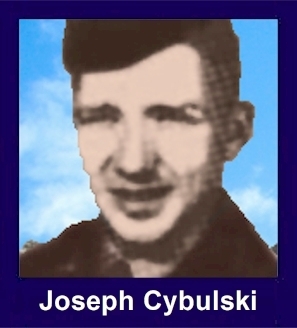 Corporal Cybulski was a Light Weapons Infantryman with Company F, 2nd Battalion, 35th Infantry Regiment, 25th Infantry Division. He was Killed in Action while fighting the enemy in North Korea on September 9, 1951. Corporal Cybulski was awarded the Purple Heart, the Combat Infantryman's Badge, the Korean Service Medal, the United Nations Service Medal, the National Defense Service Medal, the Korean Presidential Unit Citation and the Republic of Korea War Service Medal. Pfc. Joseph E. Cybulski Jr., 18, was killed fighting in Korea, September 9, 1951. The son of Mr. and Mrs. Joseph E. and Josephine (nee Strauss) Cybulski of 10814 Fortune Ave., he served with Company F. 35th Infantry Regiment, 25th Infantry Division. In his last letter, written in August, the soldier said he was expecting a rest period in October as soon as he had completed six months of overseas duty. Pfc. Cybulski attended St. Ignatius High School before enlisting in the Army in November 1950. Surviving, besides his parents, were three brothers and five sisters, Mrs. Virginia Takacs, Joan Mullee, William, Charles Mary Ann, Walter, , Irene, and Nadine. Services were held in SS. Phillip and James Catholic Church. Pfc. Cybulski is interred in Holy Cross Cemetery. Information as gathered from the Cleveland Press, October 2, 1951, January 26 & 28, 1952.